The ANSI Centrifugal DPump meets every ANSI standard! 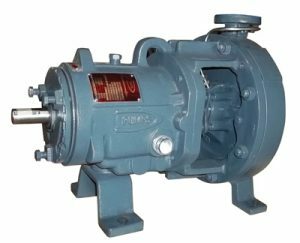 With their easy install and maintenance, the DPUMPS provide unmatched performance and reliability. Micrometer impeller adjustment reduces maintenance time by increasing accuracy. Impeller clearance to rear cover, can be set in less than 20 seconds, in the field or shop. All pumps are available with the flow-modifier seal chambers. This allows for the solids to be flushed away from the mechanical seal and eliminates the need for flush lines in most cases. All shafts have the critical surfaces ground to a surface finish of 0.4 micron to ensure the secondary sealing ability of the mechanical seal. Back pull-out design allows removal of the rotating element without disturbing the casing, piping or motor. The DPUMP Brand is available in ANSI Standard, including low flow high head, self-priming and vortex impeller designs.